The World Evangelism Fund is the cooperative genius of the mission enterprise of the Church of the Nazarene. It is based on the concept that we can do more working together than could ever be done working alone. For more information click here. provide a sense of permanence, functionally enhance ministry efforts, and convey an attitude that the Church of the Nazarene intends to "put down roots." 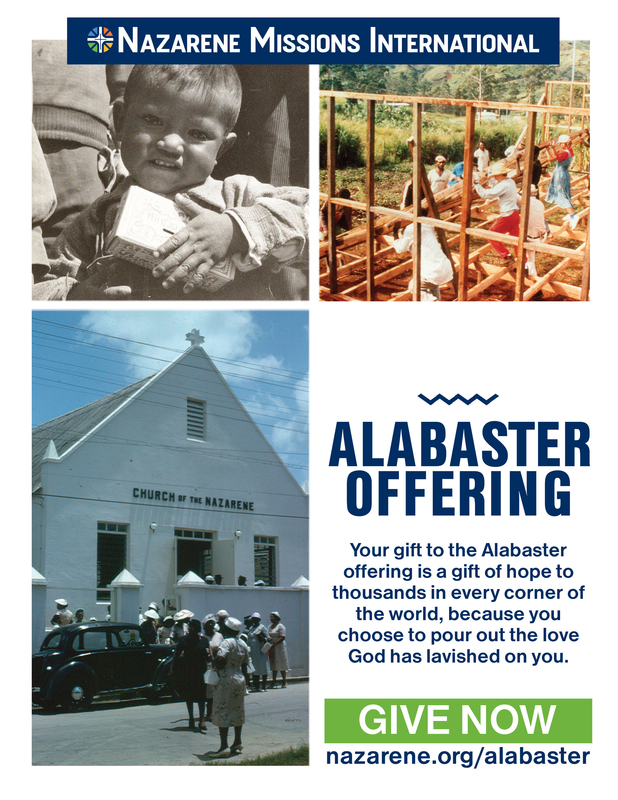 Alabaster funds help provide land for many Work & Witness projects, and the entire Alabaster Offering goes toward the purchase of land and construction of churches, schools, medical facilities, and homes for missionaries and national workers. For more information click here. The LINKS program of the Church of the Nazarene is a network of personal connections between missionaries and Nazarenes around the world. Missionaries are assigned to districts and, then on the district level, connected to local churches. This gives each church an opportunity to become personally acquainted with the missionary family and their field of service. Typically, churches send cards, cash gifts, packages, and other remembrances to their LINKS missionaries. For more information click here. The Church of the Nazarene acknowledges that Faith Promise giving is a biblical method used by many local churches for raising financial support for world evangelization. For our denomination, it is dedicated specifically to the mission support of the Church of the Nazarene through various offerings promoted by Nazarene Missions International (NMI). For more information click here. The Easter Offering and Thanksgiving Offering are for the World Evangelism Fund (WEF). Traditionally, WEF is collected through two large offerings each year the Thanksgiving and Easter offerings. For more information click here. Crisis Care Kits continue to meet the needs around the world. The kits have gone to places like Belize, California, Dominican Republic, Greensburg, KS, Haiti, Jamaica, Jordon, Louisiana, Philippines, Senegal, Sri Lanka, Ukraine, and Zambia. Your generosity makes an incredible difference! Each local church is challenged to donate enough kits to fill at least one banana box (six CCKs per banana box). The CCK emphasis will be December (NMI's month of emphasis for Nazarene Compassionate Ministries); however, kits may be received year-round and people are encouraged to provide kits when disasters occur around the world so quantities will be sufficient. For a list of items click here.